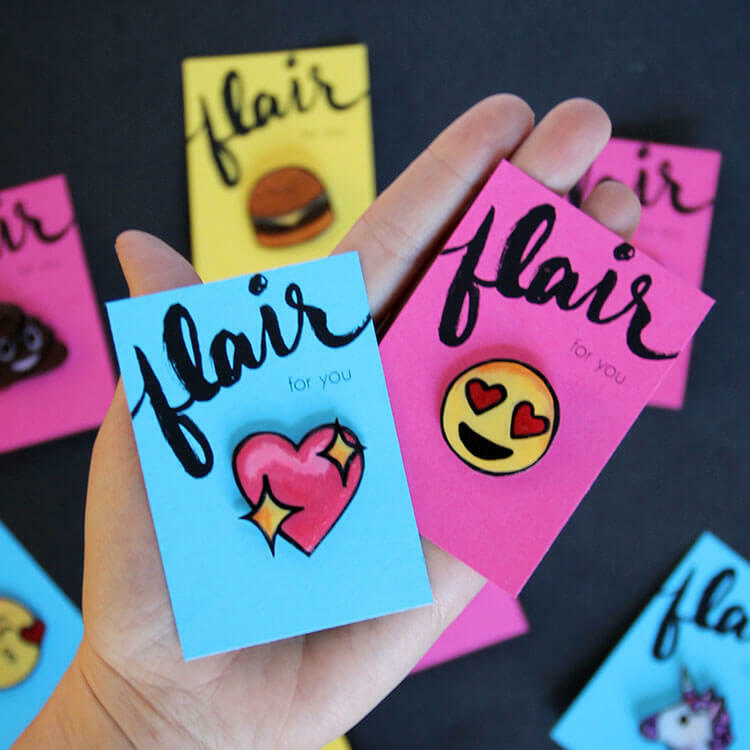 These DIY Lapel Pins are easy to make with plastic shrink film and are a whole lot of fun to wear! 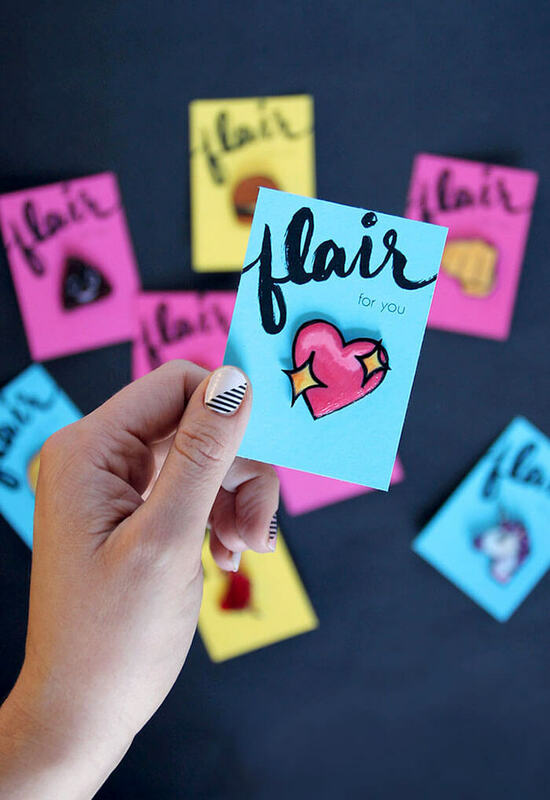 Pick your favorite emoji to wear or give them as gifts with the free printable “flair” cards. This post contains affiliate links, which help to support this site. Thanks! Are you guys into the flair trend? 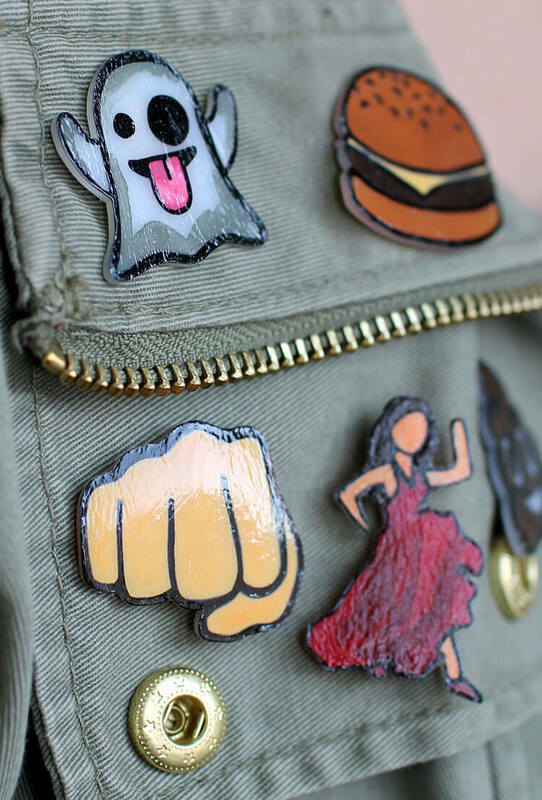 I’ve been building up my collection of enamel pins and patches lately – it’s so fun to add a little kitschy touch to your jacket or bag – so it was definitely time for a DIY pin project. I decided to go with emoji because they are fun and kind of ubiquitous and actually becoming part of our language (did you hear that Oxford picked an emoji for their 2015 word of the year? Crazy!). 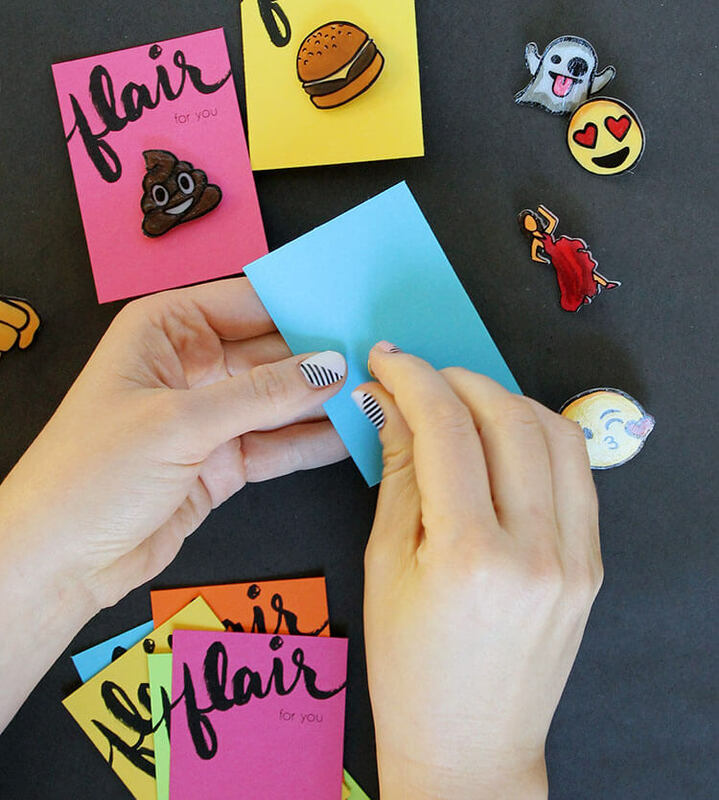 Plus, I’m thinking these pins make awesome sauce gifts for friends – just pick your bud’s favorite emoji and attach it to one of the printable flair cards I designed for you guys (Yay!). 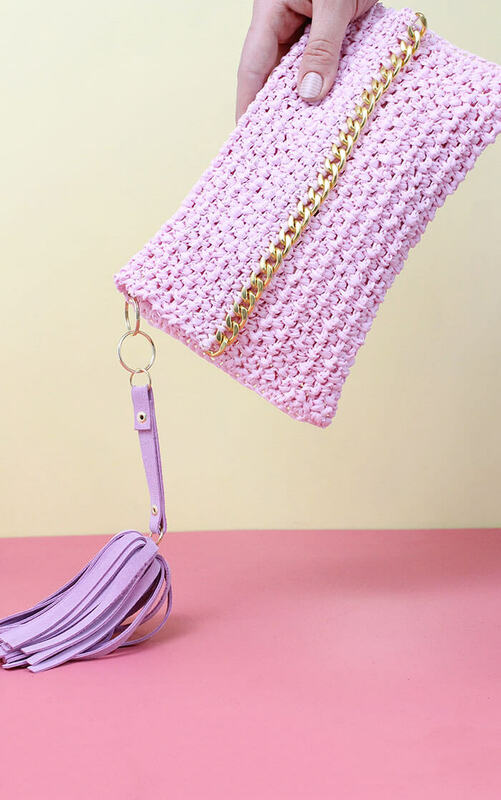 And how cute are these for funky stocking stuffers? Perfect, right? 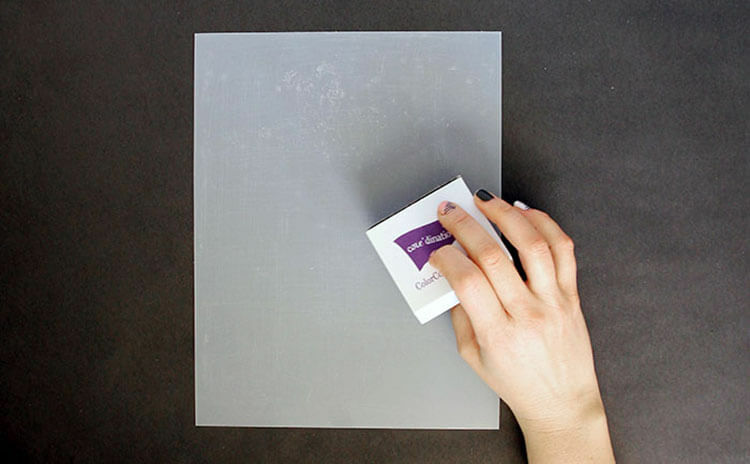 Start by gently sanding the shrink film and wipe off any dust. Roughing up the surface helps the paint to adhere to the plastic. You can also get shrink film that is pre-sanded, which is great, but it is clear, so if you use it, you may want to paint the back of the piece after it is shrunk to avoid the pin showing through. I chose some of my favorite emojis and used photo editing software to resize them to about 3″ wide. Then I printed them out on regular copy paper. 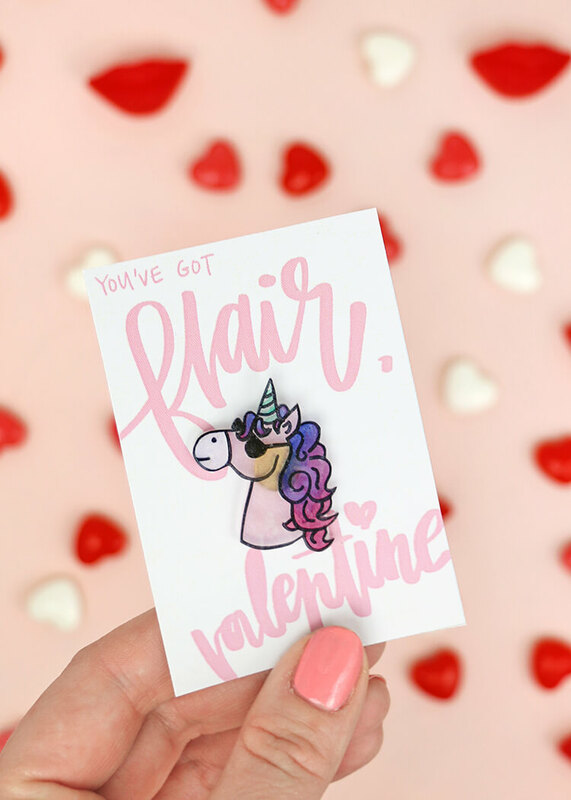 (I have also made Sweet Shop Pins and Valentine’s Day Pins – check out those free designs too!) 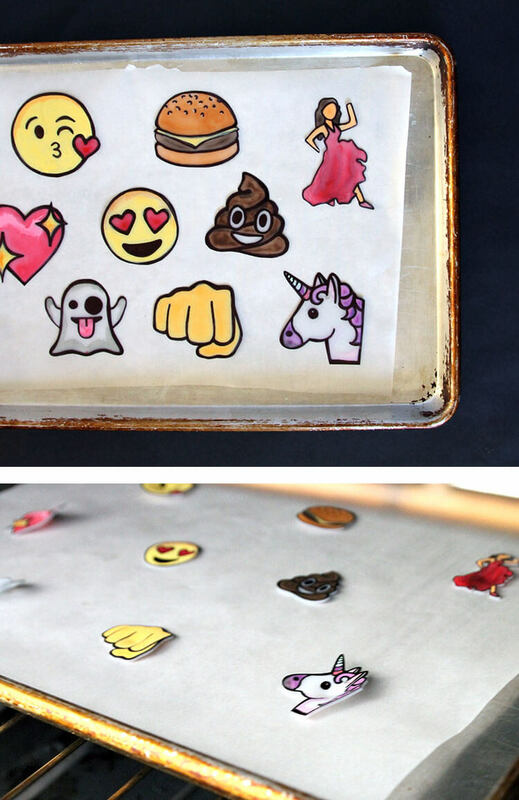 Place the shrink film on top of the emoji images and trace the outlines of each shape with the permanent marker. Once you have all the outlines traced, paint in the designs using thinned out acrylic paint. The paint needs to be pretty thin for this to work properly. If you get too much pigment on the plastic, it will kind of clump up and create a texture on top of the plastic after it shrinks, which isn’t the best. You can even get a kind of watercolor look with this technique, which is pretty fun. Also keep in mind that the colors will get a big darker and more saturated as the plastic shrinks. After you are finished painting, you can go back over the black lines with your permanent marker if needed. 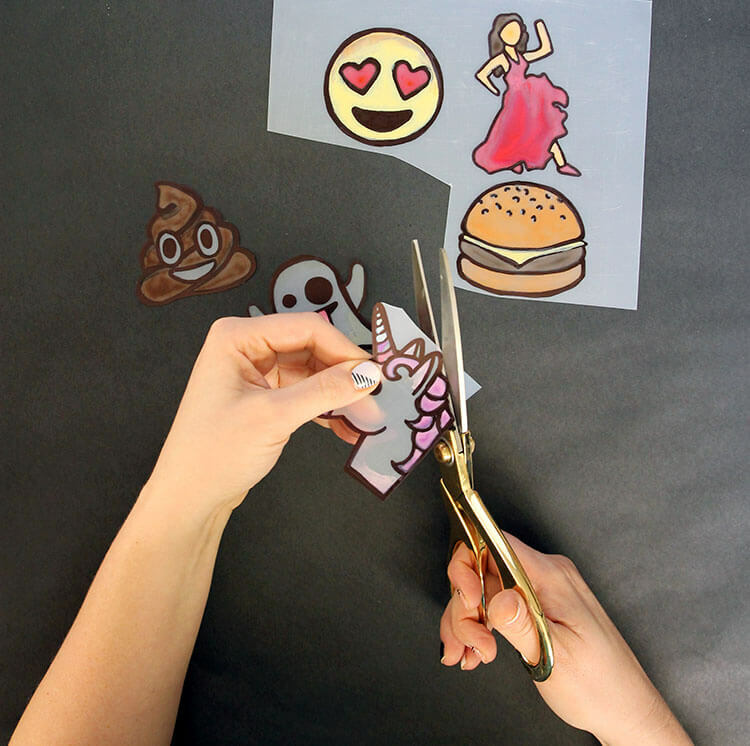 When you have your emojis all traced and painted, it’s time to cut them out. Cut right along the black line so there is no white space on the outside. 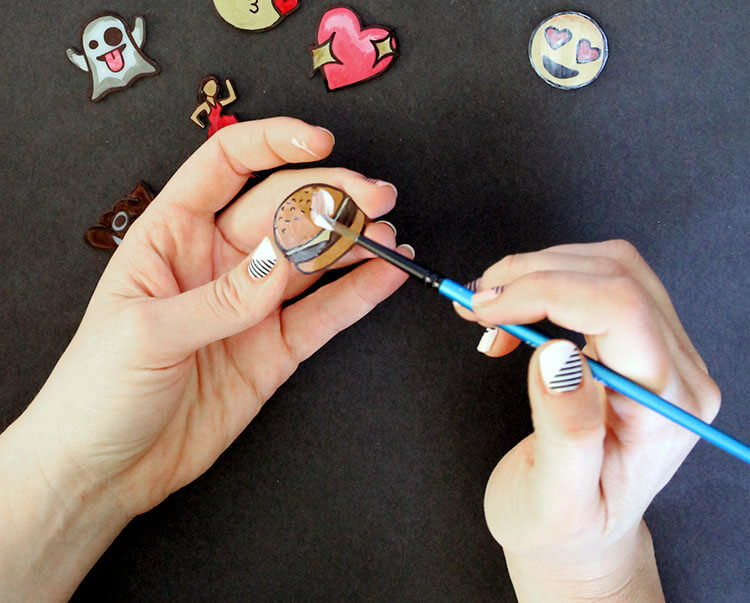 After your emojis have cooled completely, you can add a clear topcoat to make them nice and shiny. I used brush on gloss decoupage, but I think a spray on sealer might work even better because I didn’t love that you could see the brush strokes on the finished pins. 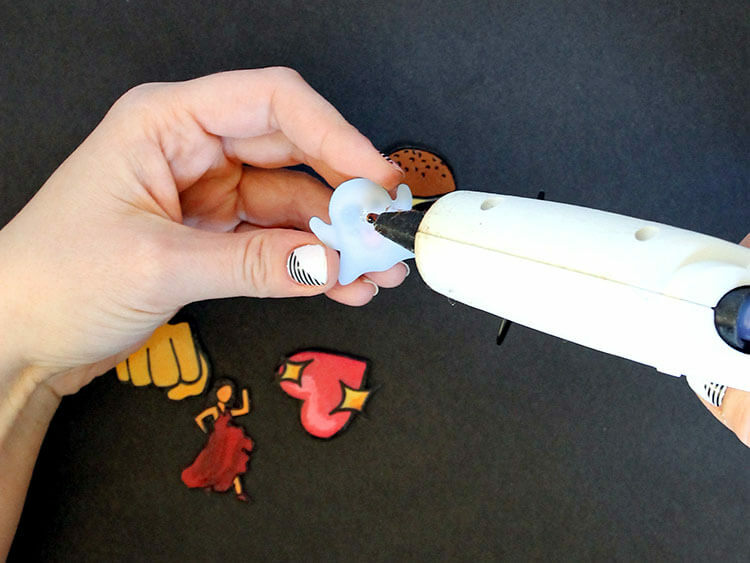 Finally, after the top coat has dried, use a hot glue gun to attach pin backs to the emoji shapes. And that’s it! 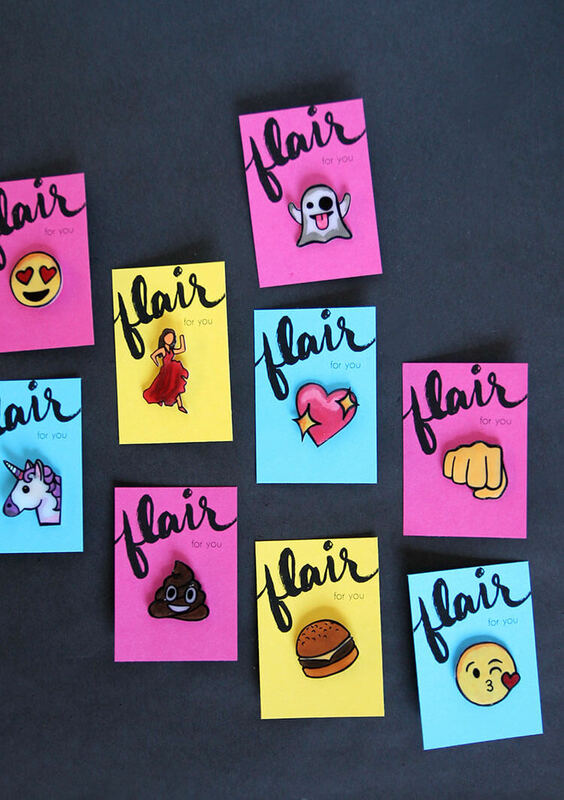 Your new emoji flair is all ready to wear. 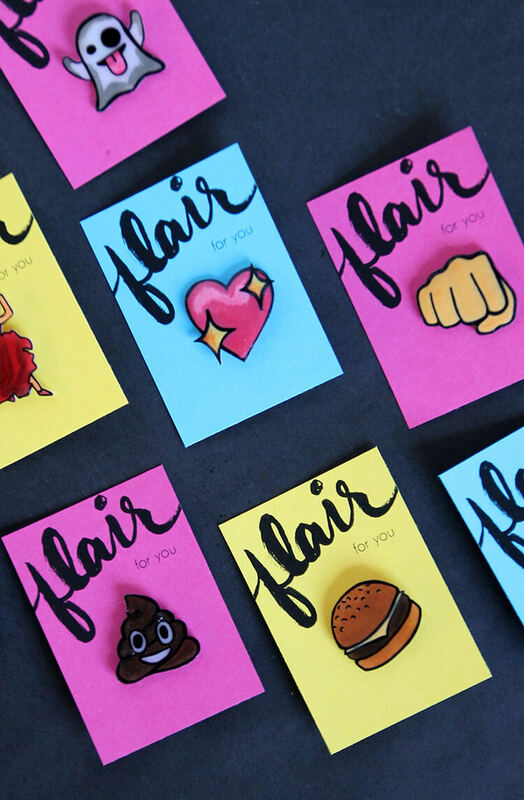 I thought these DIY Lapel Pins would make really fun little gifts and stocking stuffers. 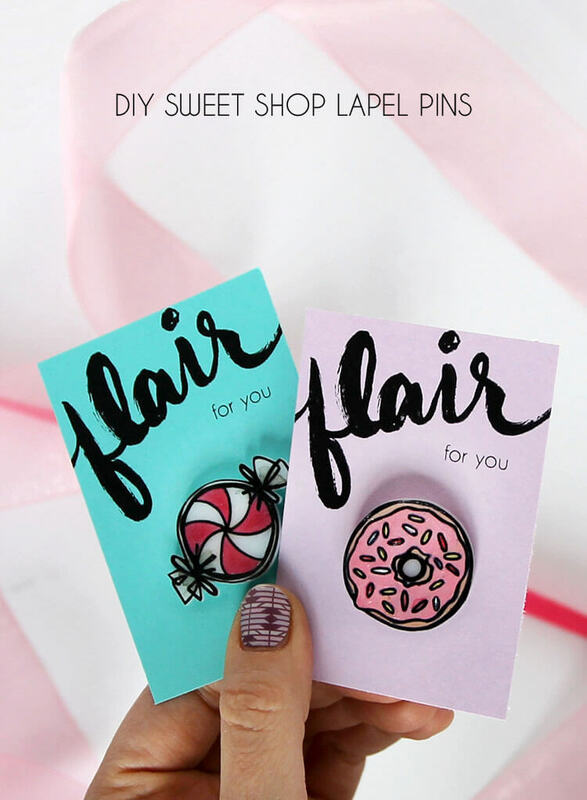 If you are gifting the pins you make, you may want to print off some of the gift cards I designed to go with them. Download the “flair for you” cards right HERE. Just poke the pins through the cardstock and attach the pin back to hold it in place. 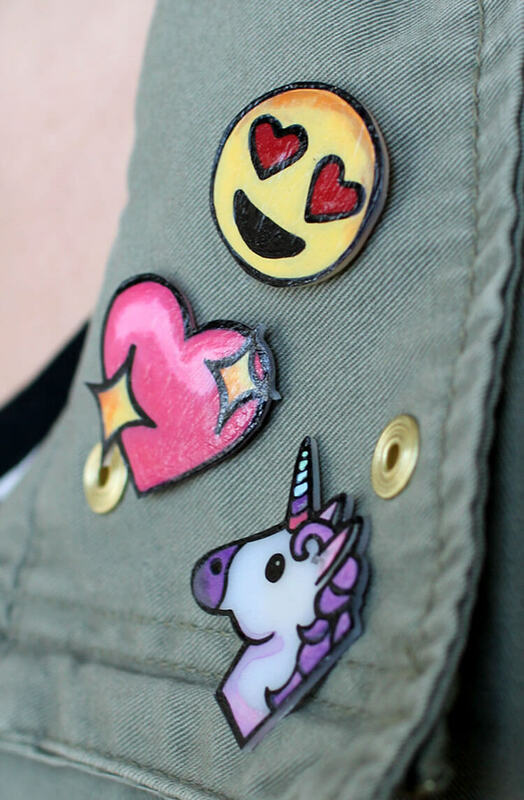 If you make your own DIY Lapel Pins, I would love to see them! Share your photos to my facebook page or tag me on instagram or twitter (@persialou), and don’t forget to use the hashtag #persialou for a chance to be featured. These are the cutest!! I should make some of these for my teens stockings, she would LOVE these! Yes! I think they are perfect for stockings! Hahaha… I love those too! Cute!! 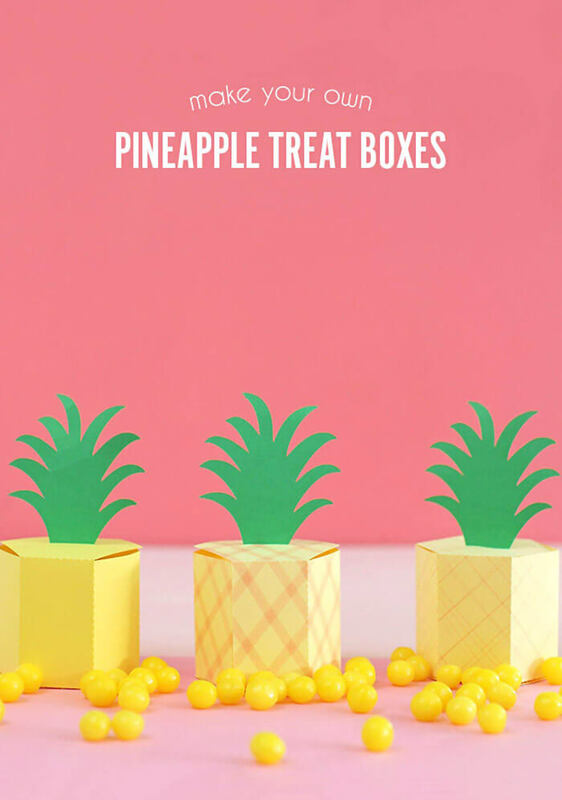 These are so fun – my oldest would love making these! Yes! My kids made some of their own too and just loved them! I love shrinky dinks!! These emoji’s are too fun. I NEED to make the little poo pin! I get a kick out of that one every time. 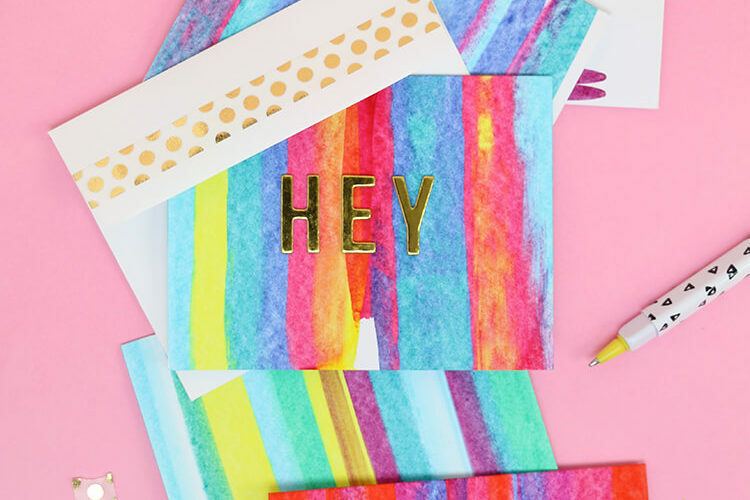 Seriously love this DIY! It’s so nostalgic to see anything related to Shrinky Dinks..
I’m sorry, I don’t! But just do a quick image google search for whichever ones you want. Good luck! wait how many centimeters is 3” ? 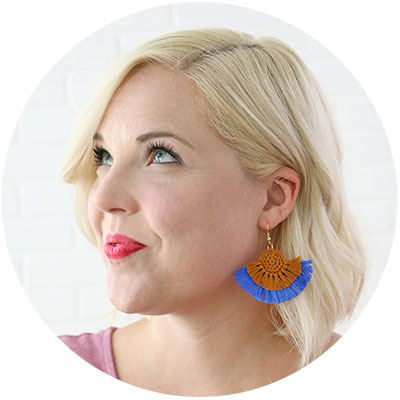 Since lapel pins seem to be making a comeback, this looks like a great way to dive into the trend! I love the brightness and creativity of these. Thanks for sharing! OH MY GOD THIS IS AMAZING. I can’t wait to do this! You’re a genius. Ohmegee, this is fabulous! Fun to make and even better to give to others! The shrink paper is on the list to get! Thanks SOOO much! Hi! Just wondering what you did to thin the paint (did you add any thinning agent to it or just use a thin layer)? So excited to make these, thanks! Hi Alyson! I mixed in a little bit of water to thin it out. 🙂 Good luck! These are so cool! 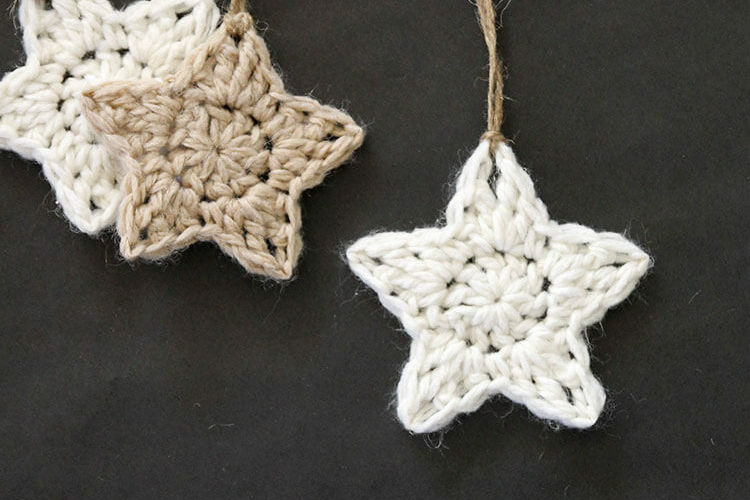 I will definitely be making some to add as little gifts with my webshop orders. Thank you!! 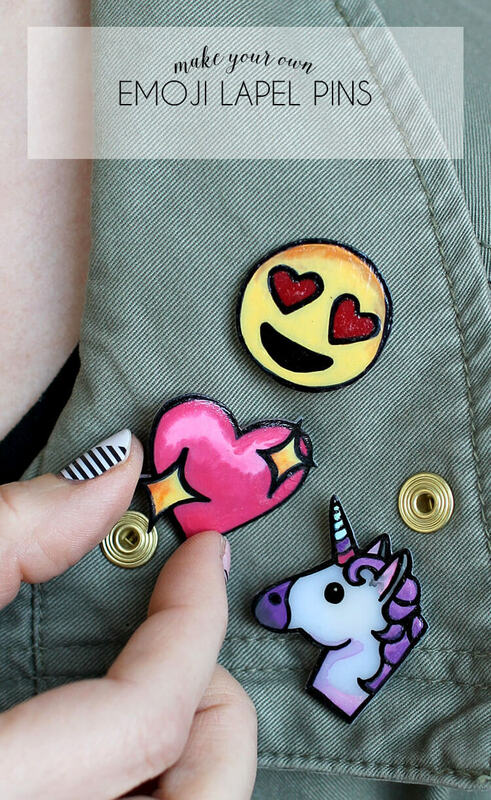 Oh j’adore ton DIY il est vraiment trop cool! 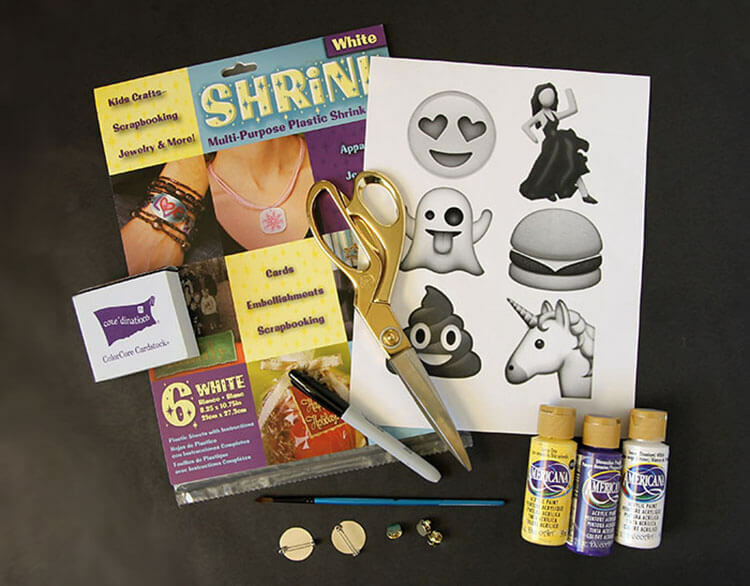 Do you have a print-out of the emoji’s to trace, like in your one picture. 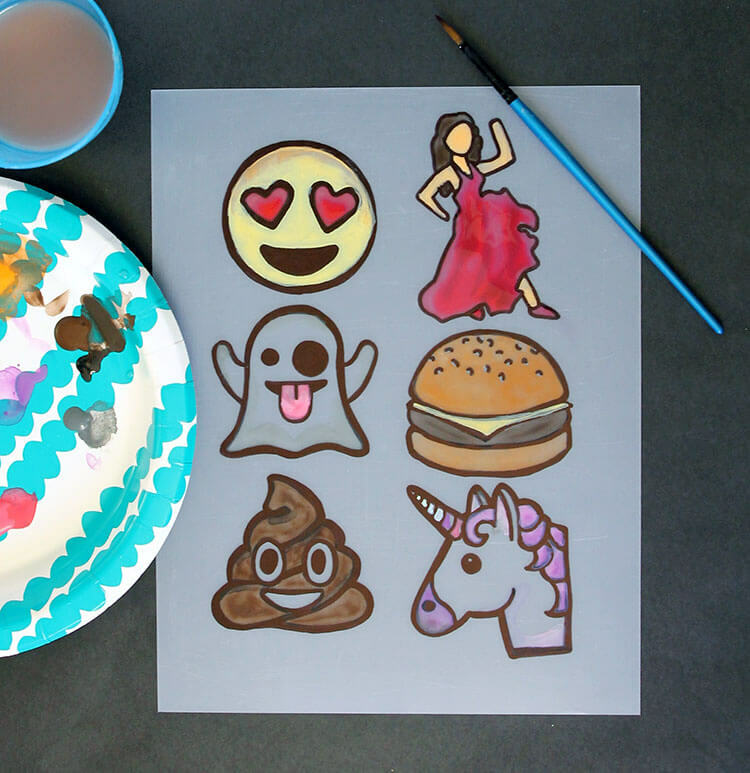 I don’t have the software to enlarge the emoji’s like you did and i really want to do this as a craft for my daughter’s 8th emoji themed birthday party. Hi Britney! 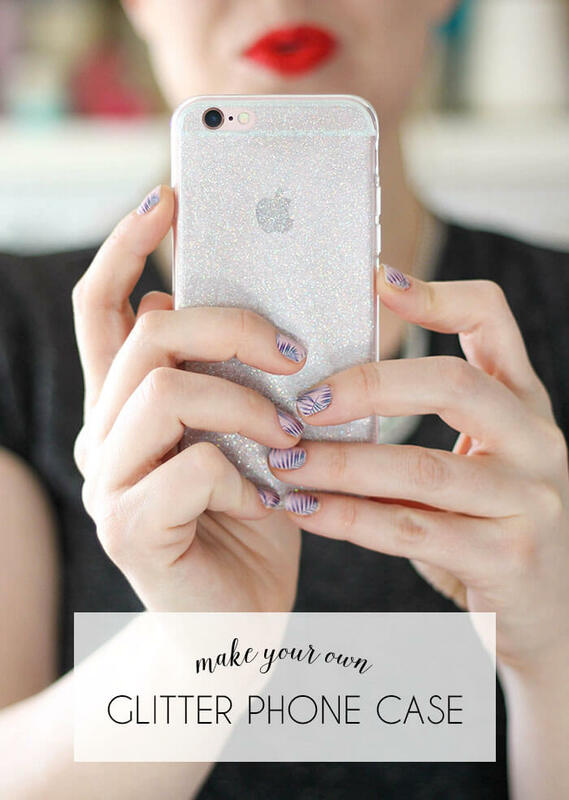 I don’t have a printable, but you can use Canva.com to size the photos – it’s free online photo editing software. Good luck! Could you use sharpies rather than paint? Hello! Thanks for this DIY, I will try it today! But I don’t know what is a “shrink film” in French :/ Do you gave any translation for that term? Hello! It is a thin plastic sheet that gets smaller and thicker when it is heated up. One brand is called “Shrinky Dinks.” I see it on amazon.fr. I hope that helps! Good luck! What a great DIY post! You did a great job with it! Tried these out myself! Didn’t make emojis, made my own cute ones! The only thing is that the baking process wasn’t great, they curled up and stayed curled, even after I put them in longer. The instructions said on my shrink paper to do 350* but I did 250* like you did. Ended up having to shrink them myself over a candle and flatten them haha. Do you know any other solution to this? Still a fun idea and they turned out alright, just maybe a little more effort went into it. Hi Morgan! So sorry you had problems with the baking! I know that can be frustrating! I was probably using a different brand of shrink paper than you were so I would definitely recommend following the instructions that come with the product you have. I’m glad you were able to figure it out. 🙂 Thanks for stopping by! What do I do if they curl way more than they did in the pictures and don’t flatten? Never mind, I think I solved the problem. Sorry, I’m not sure how to delete the comment. Thanks for the great post! What a neat guide, I had wanted to have a lapel pin custom made…but I can only find places that do them in bulk and they’re way too expensive. This is a great alternative and I can just do them myself! Thank you! I love making things with shrink plastic but I’ve always found it shrinks a little more in one direction that the other, so a square becomes a rectangle. You don’t seem to have had that issue so I’m thinking I need to try a different brand of plastic. these are so cute, I’d love to give them a try. Hi Julie! I have not had that problem, so yeah, maybe try a different brand? And definitely be sure to follow the baking instructions that come with it. I have found different instructions for different brands. Good luck! I was at multipule stores, and all were sold out! When I ask why they all said people were making these! I was wondering could you also color in the pins with sharpie before baking it or does it have to be a specific paint? Yep! 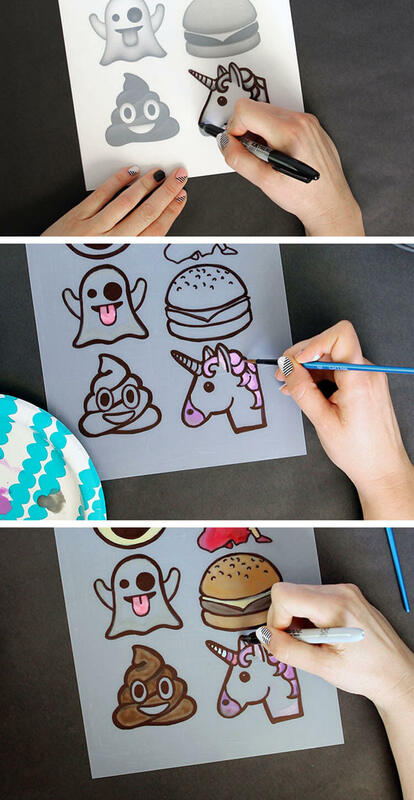 You can color in with sharpie, but the colors will be a lot darker. You are going to get a kick out of this !!! ….Like some of the people “above” found… ,,,,We ran out of the product…. so guess what we did….? that’s what we called them…. the lids that grocery stores put on liver, and potato salad , /etc !! They were round and made such cute little pieces !!! actually went to a wholesale grocer and bought a case of a thousand lids !! !